Throughout my career I've made it a point to contribute content whenever it's needed. ​Check out some of my contributions below. SnapApp puts on a series of Marketing Fit workshops. There are exclusive, hands-on workshops for B2B marketers looking to learn and test out interactive content by transforming their PDF-first marketing strategies into stronger, more balanced approaches. Get in touch to learn when we'll be in your neighborhood! ​Interactive Video: What Exactly is Interactive Content? Ever heard or see interactive content? More and more B2B marketers are pursuing an interactive strategy as a means to improve engagement, capture prospect insights, and become increasingly more personalized and relevant. Not exactly sure what it entails, watch this quick interactive video to find out! Your customers will be happiest when your content teaches them how to be great instead of telling them how great you are. Stop selling and start educating. If you notice engagement with your content slipping, you're not alone. Learn how content marketers can use a personal touch to reconnect with their audience. Your prospects, their need, and knowledge are more advanced than ever. In order to drive sign-ups and customer adoption your mindset must change too. Create content that encourages interaction and drives usage. If you’re investing in content marketing I’m sure you’ve heard or read about the importance of sales and marketing alignment. In Crescendo's recent video blog Greg Allen discusses what real alignment means and how it looks from a sales standpoint. As part of the Percussion Software sales team, when I talk to prospective customers in financial services, I hear a lot of the same complaints over and over. To better understand the source of the problem and how web content management can be part of the solution, I’ve picked the three biggest pains in financial services web content management. 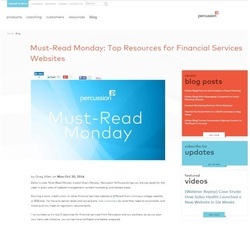 See the top 5 resources for banks and financial services from Percussion and partners to help you better plan your next website or content initiative. Content Marketing has quickly become one of the hottest, most effective ways to engage your target audience and increase online conversions. 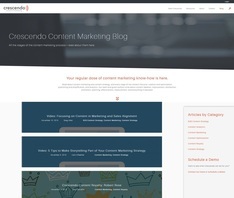 Most companies know the benefit of content marketing but wonder; How can I increase the ROI of my content marketing efforts? In offices, classrooms, and living rooms across America, March Madness dominates conversations, with everyone focused on the NCAA Division I Men’s Basketball Championship. Being big fans of higher education websites, we analyzed the athletics sites for each team in the Final Four and offer our predictions over who scored highest on the web. 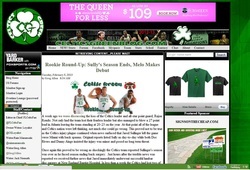 In October 2012 I became a contributor to Celtics Green as a freelance writer and graphic artist. As a longtime fan of the Boston Celtics it was an opportunity to become more involved with the historic franchise and fan base. My responsibilities included writing position pieces, post game recaps, and a weekly round up on the rookies progress through their first season in the NBA.